King's How is a steep sided wooded fell at the entrance to Borrowdale. King's How and Castle Crag form the 'Jaws of Borrowdale', the narrow entrance to the valley. Just to the south of Grange the valley narrows, until between King's How and Castle Crag it almost becomes a ravine, before widening out again into the main body of the valley. King's How is a rare example of a fell that gained a new name in recent times. The fell was purchased for the National Trust in 1910, after the death of Edward VII, by his sister Princess Louise, at the time President of the Trust. The north, west and south faces of King's How are all very steep and craggy, although many of the crags are hidden by the blanket of trees that cover most of tech slopes. Even to the east the summit is protected by a line of crags, although there is only a 200ft drop from the summit to Long Moss in the valley below. The fell is the western edge of Grange Fell, a large upland area that also included Brund Fell, and forms part of the barrier between Borrowdale and the side valley of Watendlath. King's How is an excellent viewpoint. To the north there is an unusual length-on view of Derwent Water with Skiddaw in the background while to the south Borrowdale is seen to good effect. The view across the rest of Grange Fell is less dramatic but also interesting, and did inspire me to explore the area. There are three ways to approach the summit area each of which leads to a specific path on the summit. The first line of approach comes from the north, and follows a steep path that runs through the trees near Brock Bield. This path emerges onto the open fell and climbs up the north-eastern corner of the summit. The second comes from the south, starting on the Borrowdale read near Eelstep Brow. This path isn't quite as steep, but also emerges from trees onto the open fell, where it turns north and approaches the summit from its most open side. The third approach comes from the south east and can itself be reached in two ways - one path comes across the top of Brund Fell from Watendlath and the other leaves the Borrowdale to Watendlath path at Belt Knott. 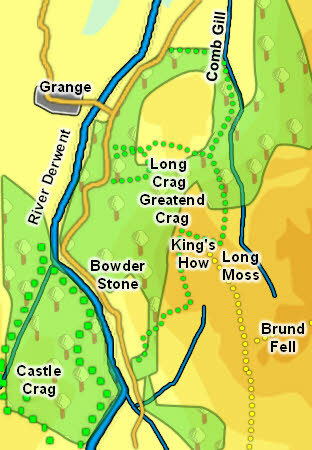 The two paths merge west of the summit of Brund Fell and head north-west. They cross Long Moss then climb up a gap in the eastern crags of King's How. This path joins the northern approach, where we turn left to reach the summit. We have a short but steep ascent of King's How from Borrowdale. King's How has a small summit with a mix of heather and rocky outcrops, and is a delightful place to linger and enjoy the impressive views of Derwent Water and Borrowdale. Be aware that there is no direct way off the summit to the east - if you want to use the path that crosses Long Moss then goes towards Brund Fell head north from the summit, on a path that drops down a series of rocky steps. Look out for a path that branches off to the back and right, heading down a grove that runs below the crags. The River Derwent forms the western boundary of the fell. A nameless beck runs south from Long Moss. This joins Frith Gill at the foot of the slope and the combined becks flow north-west into the Derwent. To the north a nameless minor tributary of Comb Gill forms the boundary, running north past High Lodore and joining the Derwent at Cannon Dub. King's How has no tarns. The Bowder Stone, at the foot of King's How, was once a major attraction. A 'hermit' lived near the stone and controlled access to it, and for a least a century there has been a staircase leading to the top of the 30ft high boulder. You will often find climbers bouldering on the rock. The Bowder Stone is still worth a visit, although it doesn't impresse the modern visitor quite the same way as during the Romantic era.